Due to the nature of the war with Germany the Soviet Navy took a back seat during the Great Patriotic War (WWII). However, one of the areas they were able to contribute greatly was with personnel. During Naval Infantry's early battles in 1941 and 1942 they showed high morale by their sheer willingness to accept high casualties during the desperate fighting for their own naval bases. Their stubborn tenacity unnerved the Germans, leading them to be nicknamed the 'Black Death' by their German foes because of this and their black uniforms. 6 figures of the famous Soviet Unit "Black Death"
ZVEZDA has put out a nice looking kit, lots of details and equipment. 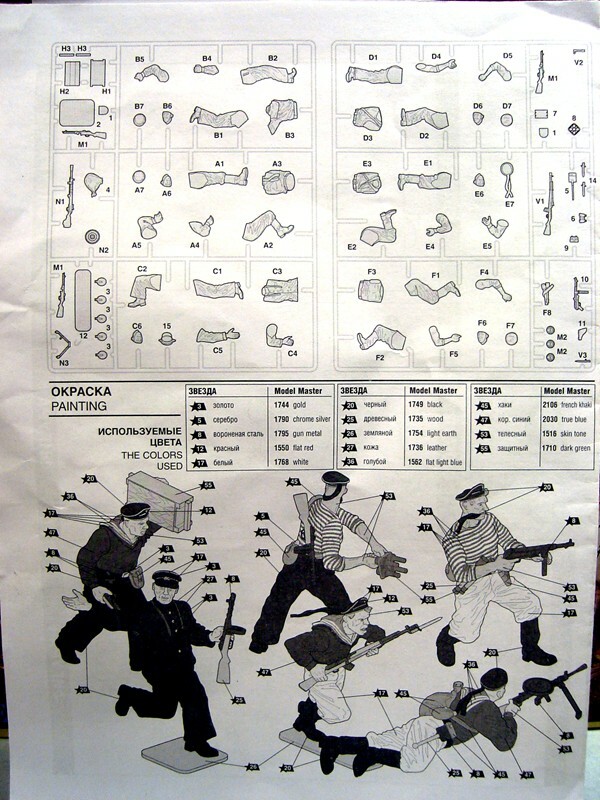 All the parts come on 2 trees, with an instruction sheet that has nice painting directions. The face and hand details are very nicely done and will look good when painted. They have lots of deep shadows to work with. The equipment details are also nicely detailed. The parts have very little extra flesh from the molding process, and the seam lines are very thin and did not take much time to sand down. I put together 2 of the figures in about 15 minutes. They will need very little adjusting to close any gaps. Over all a nice kit, I highly recommend it for all modeling levels. I would like to thank ZVEZDA and IPMS/USA for the opportunity to conduct this review.